battery chargers available. Some are designed to quickly charge a battery in as little as 15 minutes. 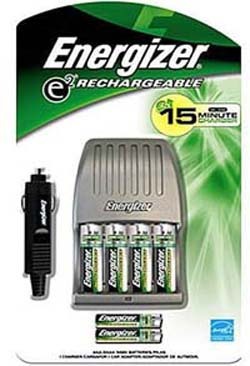 Although there are lots of ways to charge these batteries there is no easy way to test them. 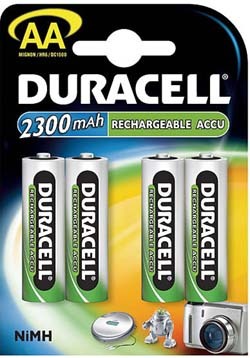 How do you know if the 3-year-old batteries you have been using are ready for the recycle bin? You discover that the 4 AA cells which you use in a digital camera runs out of juice after only a few shots. You know that there is one or more of the 4 cells which is bad, but which ones? What I would like to see is a battery tester unit. A really bad battery is easy to spot and to test but a battery whose Amp-hour capacity has gradually reduced is harder to test. The only true way to weed out the bad cells from the good ones is by loading them down with some current and time how long they can support that current before reaching a critical cutoff voltage. The tester I have in mind might be set up to test one to 4 cells at a time. A rough sketch of such a device is shown below. 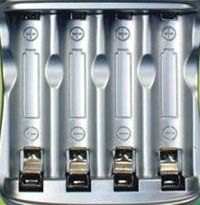 A four stall AA or AAA battery holder is plugged into the unit. The “end of test” cutoff voltage and the test current levels would be adjustable, using two multi-turn potentiometers. A digital panel meter on the tester would allow these settings to be measured. A “start” pushbutton switch would begin a test. Once started, a fixed current would be drawn from the individual cells in the holder. Four elapsed timers would begin measuring the test time for each of the four batteries being tested to reach the cutoff voltage. A selector switch could display the battery voltage and the test time for each cell being tested. Indicator lights would display the status of each cell under test. 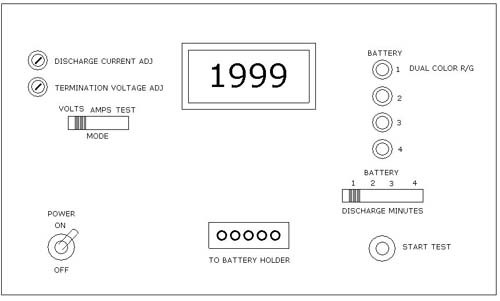 When the recommended battery cutoff voltage is reached, the load current for that battery would be disconnected. The elapsed time for the test would then be stored and displayed on the meter. Those that have low Amp-our capacities are dropped in the battery recycle bin. To accelerate the test, a heavy current would be drawn from the batteries. A 500ma test might allow the batteries to be tested in just a few hours. A more sophisticated tester, than my analog design, might use a microprocessor to control and monitor the battery testing. It might use some algorithms to accurately measure the Amp-hour capacity of each cell being tested, based on known discharge curves. The user could load the battery holder with batteries, start a test and come back a few hours later for the results.